otsoNY Comments: As with so many of the Super Hero films, much of the filming is done with blue screen technology adding the background, i.e. New York City in post production. 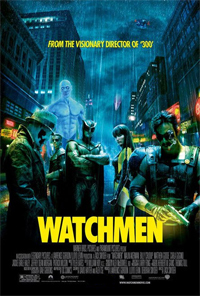 Watchmen is no exception to this rule with much of the filming shot in Vancouver, Canada. otsoNY Comments: The digital creation of Times Square is seen twice in the film. Once in the attack on the city and at the beginning when it is used to mimic an impromptu moment that gave rise to one of the 20th century's most iconic photographs. As a jubilant US sailor heard that the Second World War had ended, he grabbed a passing nurse for a celebratory kiss that has since been seen by millions around the globe.